We now offer our world leading desktop messaging software as a service in the cloud directly to enterprises as well as through our distribution partners. 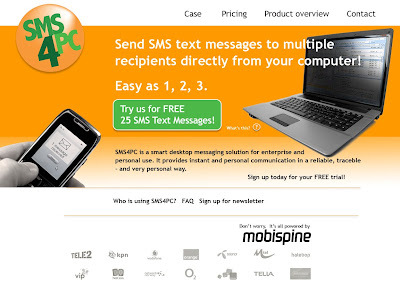 Our brand is called SMS4PC and was just launched a few months ago. Growth and numbers look very promising and so much more for us to enhance the experience for all the customers. What do you think? Simple to understand the offering? Would you feel tempted to take the "free trial"? Would you buy from us? Looks like next week is the launch date for this new "baby". We'll keep you posted! Thanks for the wonderful information..And congratulations for the new launch..I was wondering to know what is the technology behind it..I am unaware about the cloud..What is it all about? 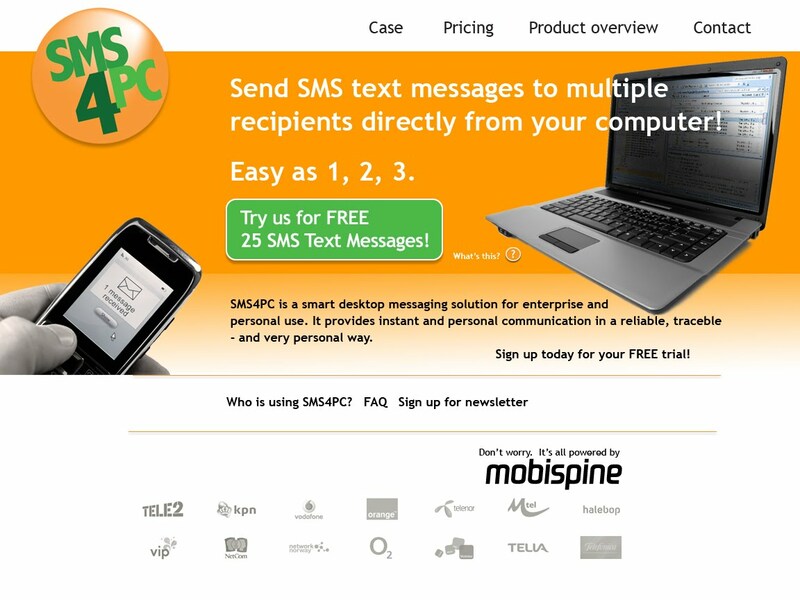 Wowww, This is Impressive blog & using Desktop messaging we send the multiple data from different computer. Nice and very informative. I am studying this problem and I must say that your article has helped me a lot. Wow... Thanks.. I'm at the first time on your blog! And I like it! Thanks for sharing info. Keep up the good work. Man is the only animal that blushes. Or needs to. This article is trully well-written.There are a lot of interesting things to take into consideration. well done! Splendid job! The topic is on the front burner and it was really interesting to read it. Write more! I really enjoyed this article. It is always nice when you read some thing that is not only informative but entertaining. Excellent services in the field of education it is possible to find in homeworkfox.com, namely that many simply need and important! Hi, I appreciate the information that you have provided in the post. It is worth noting and I really liked the presentation as well. I will surely come back for more of interesting posts. I like your blog,thanks for sharing this blog.. I even told my friends to take a look at your blog and in fact your blog is already bookmarked on my computer. Hope to see more of this. Good morning the respected thinkers and those, whoever sleeps now. As the saying goes there is no time to sleep when it is needed to do service dissertation help because clients on our site it is the most valuable people! If you were determined with a theme and ready to process order for professionals the business, to you exactly here http://topresearchpapers.com/topics. Need a friend and native help in education? For us http://www.essaybox.com/help you will find everything, that it will appear you necessary. It is good to have the ability to read a good quality blog with useful data on topics that a lot are interested on. The point that the data indicated are all first hand on actual experiences even help more. Continue doing what you do as we love reading your work. When I was a student, it never crossed my mind, that I can let someone deal with my academic needs. Awesome..! A very thankful to you for sharing informative blog. The main purpose of education is to help students gain the knowledge and skills so that they will be able to function in society. Students need to be provided with the necessary skills so that they can learn to become productive citizens. There are many advantages that are associated with receiving an education. Students will be able to contribute to their community and help make it a better place to live. Education basically helps shape society because it helps students learn to become more sociable and helps them develop relationships with their peers. Students will be more qualified for different job positions if they have a good solid education. Education is vital to each student’s life, therefore, by working hard to provide the best instruction possible will help train students to become future leaders and will lead to a better life. Education is essential to every student’s life as well as their future. Students can have a prosperous life by receiving a good quality education. My thoughts are that students need to learn from the books along with other various materials just as I did while growing up. The classroom curriculum should be decided by their teacher and the teacher should set clear goals as to what is expected from the students. Students should work hard to achieve their goals because it will certainly be worth it in the end. According to essentialism, ‘Schools should not radically try to reshape society but schools should transmit traditional moral values and intellectual knowledge that students need to become model citizens’. Read about education help at http://www.top-essay-writing-service.com . The school should stress the importance of values because some children are not taught these at home. Teaching children good values helps build their character and helps them become respectable people. In regards to education, I think society is important because this is a place where we all live so we should work to make it a better place.